The birthplace of coffee celebrates community with a sensory feast. We tend to think of tea as the hot drink to linger over, while coffee is something to throw back groggily at the beginning of the day. But in Ethiopia and Eritrea, coffee is the centerpiece of an elegant ceremony meant to be shared with family and guests over several hours. Coffee originated in Ethiopia, with popular lore pointing to a goatherd who saw his flock frolicking after eating raw coffee berries. The coffee ceremony also starts with raw coffee beans, which are washed and then cooked over a fire or stove. 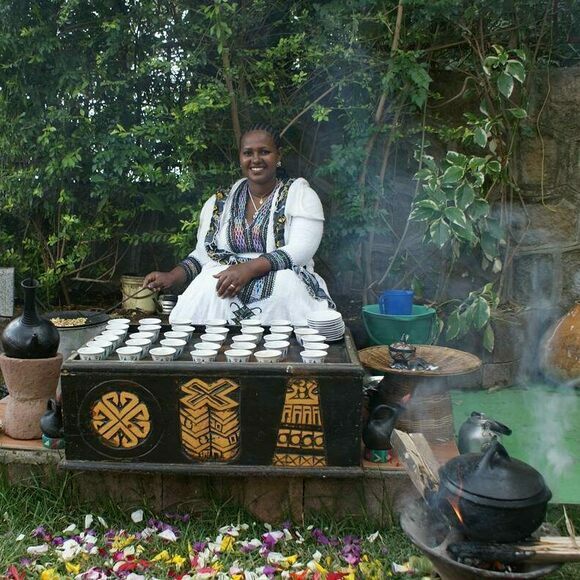 In some Ethiopian households, the coffee ceremony is conducted three times per day by a female member of the family. She typically begins by spreading fresh flowers and grass on the floor or ground, while burning incense (frankincense, myrrh, and sandalwood are popular options) to make the air even more fragrant. Then, she roasts the coffee beans in a long-handled pan until they’re black and oily, and invites guests to come closer and savor the smell. The hostess then grinds the coffee with a mortar and pestle, and adds it to water that’s boiling in a coffeepot called a jebena. When it’s finished boiling, she holds the jebena high in the air and pours the coffee into small cups (a high, gentle pour traps most of the grounds in the bottom of the jebena). Pouring neatly takes skill and grace. Often, each cup is served with a heaping spoonful of sugar and a snack of fresh popcorn. Guests typically drink three rounds of coffee, using the same grounds. The third cup is said to convey a blessing. Sharing delicious, laboriously prepared coffee serves as an opportunity to catch up with friends and entertain guests. The dreamy smell of incense and coffee, along with the buzz of caffeine and conversation, makes everyone more likely to linger. Coffee ceremonies are a regular social occurrence in Ethiopia, and these days most cafes also provide the experience. Outside the country, Ethiopian restaurants occasionally feature the events. This cafe in Brooklyn offers coffee ceremonies four days a week. A simplified version of the coffee ceremony is available to diners. If ordered, a waitress will bring a platter of coffee cups, a jebena, and incense smoldering from a dispenser to your table. The coffee will be poured from the jebena for you. The Ethiopian coffee ceremony costs $35 at this Nashville spot. In Senegal, black coffee meets sugar ’n’ spice in one heady brew. You put the charcoal in the coffee cup and drink it all up.